Iaido (pronounced e-eye-do) is the art of simultaneously drawing and cutting with the Japanese sword. Both a physical and a mental discipline, this style of swordsmanship is uniquely Japanese. Its origin can be traced back to Hayashizaki Jinsuke Shigenobu, who was born around 1543-45 in Tateoka Oshu. Originally a combative discipline known as iai-jutsu, its practice has been refined over the centuries and evolved into the art we now practice. In Iaido, the sword is drawn from the scabbard (saya) and immediately strikes an opponent or deflects their blow. All techniques end by returning the sword to the saya. We are a AUSKF Iadio Dojo, Our weekly classes are led by Tak Furuta, 4th Dan (Yondan). Tak is assisted by Clint Cross 4th Dan (Yondan), formally Dojo leader now adviser to the club. We are a registered AUSKF Dojo and are Affiliated with the JCCC-MuMonKai. Special Thanks to Rick & Yuri Polland of the Rembukan Dojo who have opened their home and Dojo to us. Our association with the Rembukan remains a highlight in our History with many fond memories of friends and fantastic instruction. The Ittokai sword club was founded in 1996 by Doug Blue who holds a rank of 3rd dan. Doug started his martial arts studies in 1979 (Iaido in 1990), he attained third dan status in Isshin Ryu Karate-do & kobu-do(Isshin Ryu Federation – Chris Chase, instructor – 7th dan); Okuiri in Kenjutsu (Kaze Arashi Ryu), and third dan CKF ZNKR. He has been an instructor at Chase Academy, Harp Karate, and the Ittokai. Doug was affiliated with the Japanese Sword Society US for 15 years) and currently the Rochester Sword Study Group. We practice the “representative forms”, known as Zen Ken Ren Iaido, and the koryu Muso Jikiden Eishin-ryu iaido, however students of other iaido styles are always welcome. Official grading is sanctioned through the Canadian Kendo Federation (CKF) and recognized by the All Japan Kendo Federation (ZNKR) of which the CKF is a member. We are forever grateful to Doug for dedicating his time and talent to sharing this unique martial art. An Iaido or Kendo gi and hakama shall be worn. The Iaido gi and hakama must be clean and any holes must be mended. Name tags must be covered or removed for gradings. With the exception of montsuki; dojo badges or insignia must also be removed or covered for gradings and shiai. All jewellery is to be removed. The hakama must have pleats and not be baggy. The hakama must reach the top of the feet, level with the ankle bone. At the feet the front should hang lower than the back. It is preferable that the hakama be black, blue (indigo) or white. No undergarments such as track pants that will show at the bottom may be worn under the hakama. The gi should be black, blue or white. The back, front and sides of the gi should not bulge, nor should the back of the neckline stick out. The neckline at the front should meet close to the base of the throat and should not loosen or come apart during practice. T-shirts may not be worn but an under-gi (juban) is permissible. The gi must be long enough to cover the leg at the side of the hakama. Tabi are only allowed under unusual circumstances and with permission of the grading panel, or in the case of shiai, the court judge and head referee. No other footwear is permissible. The obi must be of proper length and width. It usually matches the colour of the hakama. The obi should be long enough to wrap around the waist three times (creating three layers), with enough left to tie the knot correctly. The width should be at least 2 inches. The knot of the obi should be worn at the centre of the back. The obi should be tied tight enough not to slip up or down, yet not impede the movement of the saya (scabbard). The obi should be tight enough to prevent unnecessary movement of the saya during the execution of the forms. The knot should not distort the back of the hakama. Through sandan, the use of an iaito is preferred. Yondan and above may use shinken, depending on the policy of the tournament. The modern Iai blade should be between 25 and 30 inches long, measured from the mune-machi to the kissaki. Longer or shorter blades are allowed for taller or shorter students. The weight is between 800 and 1000 grams. Sageo must be used at ikkyu and all dan levels of competition. At kyu grade levels (mudan) below ikkyu it is preferred but not strictly required. For ikkyu and above it is required. Etiquette is fundamental to proper Iaido practice. Students who cannot perform correct etiquette should not expect to pass their grading. The test starts from when you are sitting at the side, waiting to do your techniques, and ends there as well. All movements are looked at. When the participant’s name or the testing group is called, he or she will approach and step into the court. Perform a small standing bow. Walk onto the floor using teito shisei, to the designated spot and stand facing the judges. With the command of “Hajime”, the participant will move the sword to the right side with the blade down and perform a standing bow toward the judges. Time begins when the command “Hajime” is given; the time limit for grading or tournament is typically 6 minutes. Return the sword to the left side. Face the starting line (usually at 45 degree angle to the grading panel) and sit in seiza behind and close to the line. Perform “To-rei”. Place the sword in the obi (taito). The participant is now ready and will proceed. Each participant will use their own knowledge of the movements and they do not have to start or finish together. After finishing the movements, the participant will return behind the starting line, sit in seiza, remove the sword (datto) and perform ‘To-rei’. Stand, face the grading panel, transfer the sword to the right hand and do a formal standing bow, return the sword to your left hand (time stops) and then wait until you are dismissed. When you are, perform a small standing bow and take three steps back starting with the left foot and then turn to your right to walk off the floor. Gradings from 1st kyu to 3rd dan must be performed with an iaito and sageo. Gradings from 5th Dan upwards should preferably be done with a shinken. Challengers to each grade are expected to show all the points of lower grade levels, as well as the current grade being challenged. The following points are a guideline to what students can reasonably be expected to demonstrate at that grade level. Know the basic parts of the sword. Understand general safety points of the sword and dojo. Big motions and big cuts with awareness of proper hasuji. Have knowledge of ma-ai and zanshin and to use the sword with spirit. Show ‘Ki Ken Tai Ichi’. Proper change between nukitsuke and kiritsuke with correct kirite and power (kiai). All the requirements for shodan, with demonstration of a deeper understanding and practice. 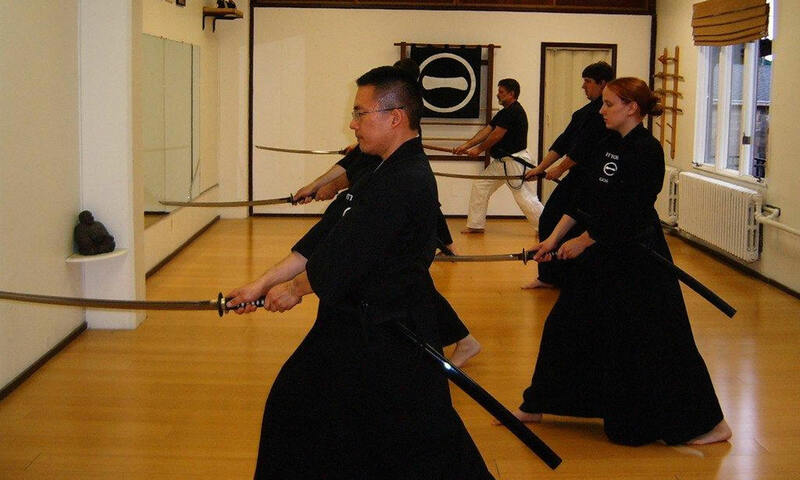 Demonstrate the technical aspects of cutting with the sword – tenouchi and taisei movements must be smooth. The kata must show proper ‘Jo Ha Kyu’. Show proper seme, ma-ai, kihaku and metsuke. Show awareness of kasso teki. To develop an awareness of the difference between satsujin ken and katsujin to. Demonstrate understanding of ‘Shin Gi Tai Ichi’ , and riai. Demonstrate awareness of kirite, tomete (mamorite) and nobite (shinite).